As much of a homebody that I am, I also like to travel and see new places, and I think it's super important to do so. Every road trip or vacation you take, and every new place you visit, adds to your own personal library of stories, experiences, and memories. And, to me, that's what life is all about! I'm not much of a world traveler. As of today, I've only visited a total of 3 countries - The U.S., Canada, and Jamaica. One day I hope to visit places like Europe and more islands in the Caribbean, but until then, I have plenty of domestic travel goals. 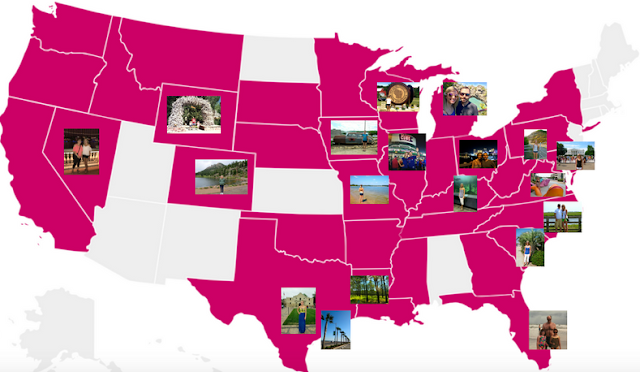 You can see all of the states I've visited so far, in pink, below. Not the greatest graphic (I used a couple of free websites to put it together), but the idea is that in nearly every state I've visited, I've made memories and experiences to last a lifetime. I saw the ocean and rode in a plane for the first time when I was 10, traveling to Florida with my family. I went fishing for the first time while visiting Trent's family in Missouri. I saw endless miles of forests in Louisiana, saw the beautiful Rocky Mountains and rode to the top of Pike's Peak in Colorado, saw the Alamo and got engaged in Texas. Sure, some states we just drove through, or I had a work conference there so didn't spend much time in that place (I'm looking at you, Nebraska). But there are so many more places that I still want to see, right here in this country. For example, I'd like to see more of Oregon and Washington, since I was just there for a short work trip. I've never been to Arizona, Utah or New Mexico, so I would love to see the Grand Canyon, Arches National Park, and the Four Corners. I've also never been to New York City, or any of the New England states, so those are other areas I would love to visit. I hope to fill in my U.S. travel map fully someday. 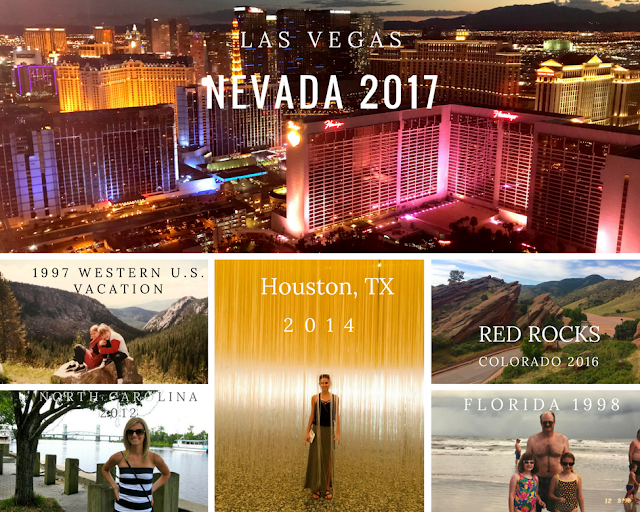 This year I added Nevada to my list, so now I've seen 34 of the 50 states. Which means, 16 more to go... I have a feeling there will be many more road trips and fun times ahead.